You should always do your research before making a donation to a group you are unfamiliar with. Not only will this help you to know whether or not your donation is tax-deductible, but it will also help you to avoid falling victim to a scam. Please note that this last item applies to any kind of organization; even if you are volunteering for a certified charity group, the hours you donate cannot be valued and listed as a charitable contribution on your tax return. While all of the donation types listed above are admirable causes, they do not qualify as a tax-deductible charitable contribution, and so cannot be claimed on your tax return. Official documentation is always better than personal records, wherever possible. However, where official documents are unavailable, it is vital that you keep written records of any cash or items donated to a charity or qualifying institution. Of course, keeping physical copies of all these pieces of paperwork can take up space, and they can be easy to lose. We strongly recommend taking pictures of receipts and keeping electronic copies of other documents in a cloud-based storage system, so that you can keep the records organized and easily accessible if they’re needed. If you claim a charitable contribution on your return, and you are audited after filing, it’s important that you have these records available. Without them, the deduction will be removed, and you could find yourself facing fines and other fees from the IRS. So, remember to ensure any donation you claim is a qualifying type of contribution, and that you are giving it to a certified non-profit, if you wish to claim it on your tax return. And when you make the donation, make a record of it, and store it somewhere you can access it when you file your return. 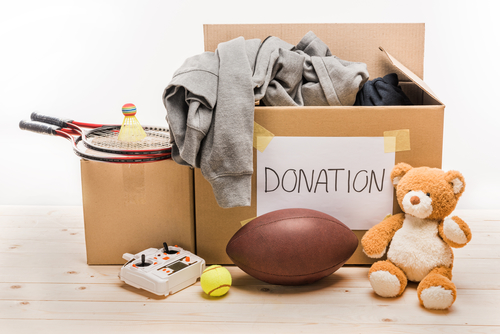 If you’re ever uncertain about whether or not a donation qualifies as a tax deduction, it is always best to make a record of it. When tax season arrives, bring your records to one of our CPAs, and we’ll help you to determine whether or not the donation can be added as a deduction on your tax return.